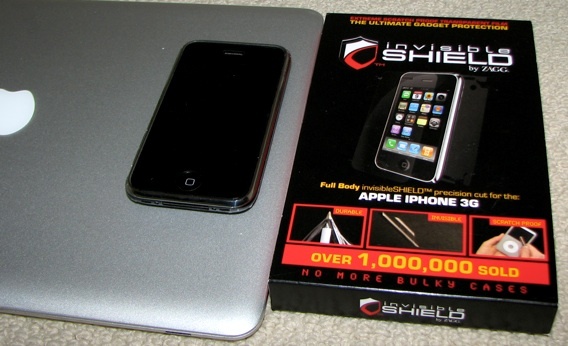 I featured the Zagg’s Invisible Shield for the iPhone as the gadget of the week during last week’s Dot Com Pho. Since then I’ve put the shield on my iPhone, MacBook Pro and MacBook Air. The Invisible Shield is a skin of virtually indestructible film that will protect your expensive blogging equipment from unsightly scratches, dings, keys, etc. It’s main selling point is that it’s invisible (hence the name) and adds almost no weight to your equipment. Invisible Shields are customcut to fit your hardware perfectly. It is so tough that Zagg backs it with a lifetime guarantee. If it ever does wear or scratch, Zagg will replace it for free, for the life of your device. Below is a video showing what happens when you key an iPhone with and without an Invisible. I’ve also included an video of Gary and me installing an Invisible Shield on my MacBook pro.